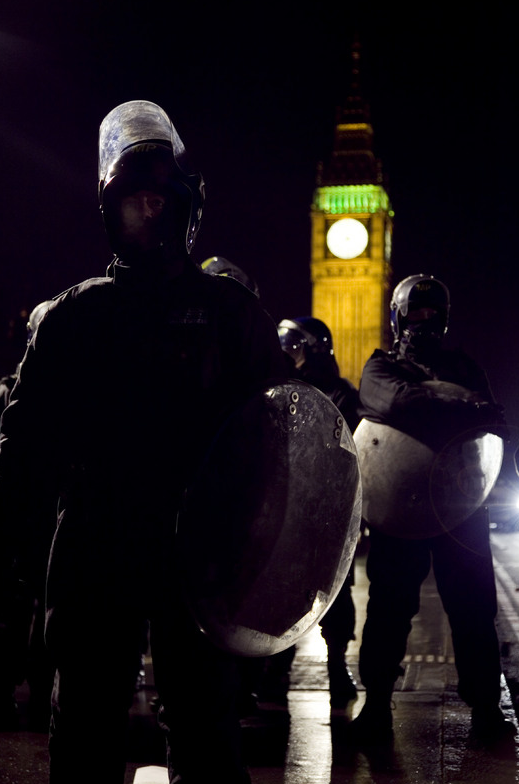 Riots happen more often than you might think around the globe, but when they happen in London the shocked response is always the same: how could that happen here? This is the West, for Christ’s sake: civilization, democracy, and continual progress are supposed to be the order of the day. Why would the people riot against representative government, and why destroy the businesses lifting up your own neighborhood? The combination of a European locale and the seeming lack of reason have lead some to label the violence a peasants’ revolt. The modern world is not supposed to contain peasants, and thus irrational behavior by the urban masses can be dismissed as a senseless throwback to more primitive impulses. But what if the same analogy holds for the state? These warriors could be time travelers from the past, transported in their armor, helmets, and shields to stand before Big Ben in some Gothic fantasy movie. 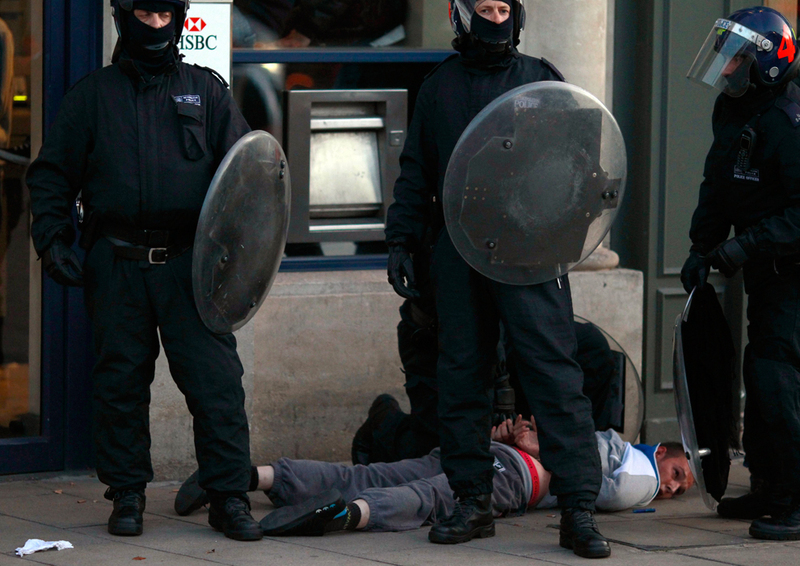 The photo has been sitting on my desktop for months–yes, that’s right, it is not from the most recent riots, and it, too, was taken in London. I’ve kept the photo because it so perfectly captures a dark tendency that is spreading across the globe: what might be called a new feudalism. In place of the egalitarian principles and shared prosperity of the twentieth-century social contract, we see a savage reassertion of economic power backed by ever greater investments in security forces. And, whether accidentally or otherwise, those forces increasingly look like the private armies of the late medieval period. And it’s not just London. These knights are patrolling amidst the destruction last year in Vancouver. Again, the one on the right could be riding out of the 14th century. And we can still feel the effect that cavalry have when seen from ground level by relatively unarmed opponents. As working people have been driven down in the economic order, they also have been driven down in the political process; taking to the streets becomes the only remaining option when the government has been captured by the same elites that are grabbing and hoarding the society’s wealth, common resources, and its future. Riots always play to the worst elements in a society, but those are not their causes. The late-medieval uprisings were the result of conditions that sound all too contemporary: expansion of the income gap between the rich and the rest, corrupt government serving elite greed, massive deficits caused by expensive wars, and environmental changes that degraded everyday life. Yet it remains all too easy, even among those who recognize the underlying lesson of the analogy, to deny its full implication: the riots and the police response are merely matching symptoms of the same disease. 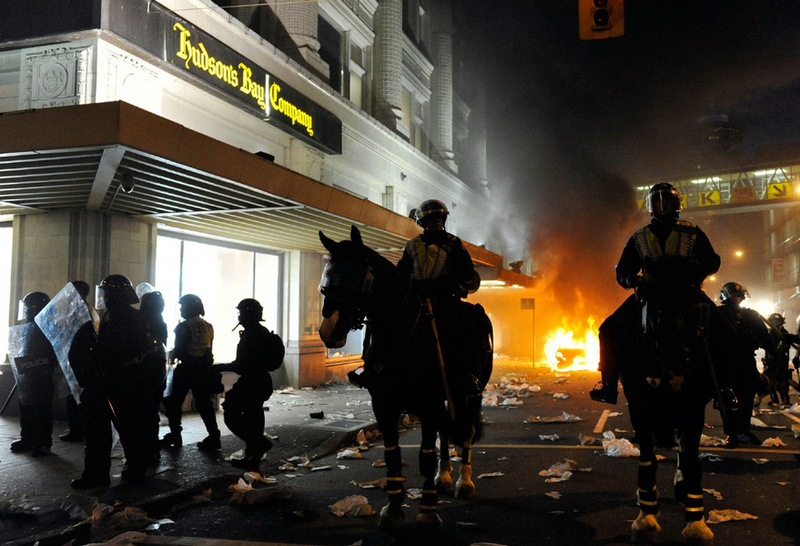 As the social order is transformed from a modern to a neo-feudal system, riots will become all the more common while money that could address the causes of the unrest will be poured instead into security. Perhaps it should be no surprise that those security forces are looking more and more like something seen in a distant mirror. So take a look at the look of the future. I’ve lost the citation for the first photo, and Tin Eye can’t find it either; any help would be appreciated. The second photo is by Rich Lam/Getty Images, and the third is by Stefan Wermuth/Reuters. Next Post →Interactive Exhibition: What Happens Now? This is one of the clearest writeups on the riots that I’ve read. As the poorest get poorer and money rises to the top, corruption is tolerated at the highest levels instead of prosecuted and the population pay for the mistakes of the richest, undirected anger will rise. Cogent, clear, concise, and most importantly: accurate. Unfortunately, an accurate general observation about modern Western economy and society.